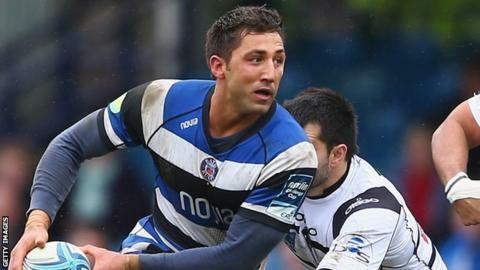 Bath boss Mike Ford has said the club are still undecided on the future of Wales international Gavin Henson. Henson, 32, signed a one-year deal at The Rec last summer after joining from London Welsh. "We are talking to Gavin at the moment," said director of rugby Ford. "He has been brilliant in the respect that he is not rushing us to make a decision on him. He understands exactly what is going on. He has been as good as gold in terms of his attitude." Henson has played 20 times for Bath this season, including 12 Premiership games, and played a central role in Sunday's Amlin Challenge Cup 39-7 win over Brive, assisting two tries. But the 33-time capped Wales centre has been linked with a move to Newport Gwent Dragons, whose coach Lyn Jones is Henson's former boss at London Welsh and Ospreys. Henson has not spent more than one season at any club since leaving Ospreys in 2009, having had spells at Saracens, Toulon, Cardiff Blues and London Welsh. "We will make a decision on him when it's right. The quality of his performance [against Brive] was good," added Ford, whose side are fourth in the Premiership. "He gives us strength and depth to our squad. He is a different player to Kyle Eastmond at 12, but you need those players so you can play different ways. "He can kick a ball a million miles, he can be a little bit more direct and he can kick goals for us. Now he is fully fit and he has got a run of games, it's looking well for the business end."